It really feels as though the anime is coming to an end now that NTV have released the very last batch of previews. I've put them at the end of this (short) post. 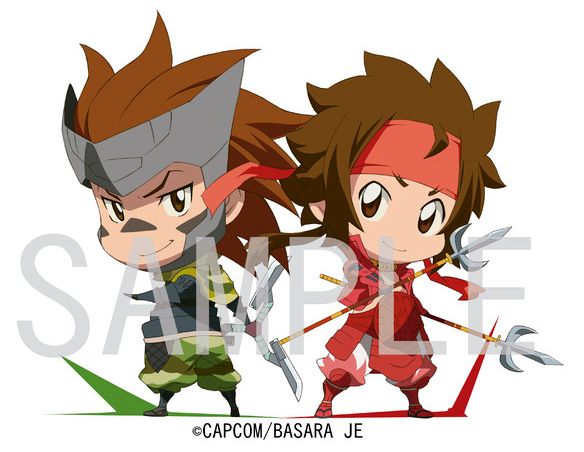 A Sengoku Basara Judge End mini towel (20cm x 20cm) is due for release in mid-September priced at ¥500. It will feature cute versions of all four lead characters. Ieyasu's face is probably my favourite part of this tiny preview picture. Aww! The details of the second volume of the anime's Japanese home video release have now been confirmed thanks to Dengeki Online. 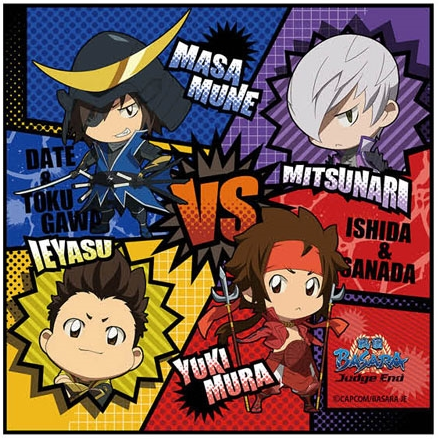 The special audio CD from the first press edition will include episodes of the Hoshi Souichirou and Seki Tomokazu's 'Sengoku Basara: Judge End' Radio show with a special guest appearance from seiyuu Ookawa Tooru (Tokugawa Ieyasu). 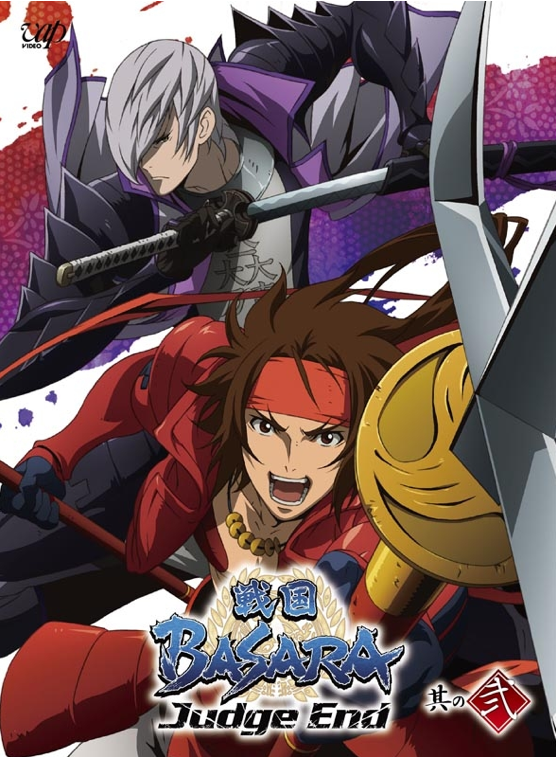 Here's the newly-unveiled Sengoku Basara Judge End: II DVD/Blu-ray cover artwork. The set will come in an illustrated digipak with a 20-page booklet. It doesn't seem as though Amazon, Tsutaya and Yodobashi Camera are going to have exclusive items for the second volume of the anime. The second exclusive keychain depicts Yukimura and Sasuke as promised. The official website has also shuffled the roster page around, to add the new characters and reflect the changes in allegiance which have occurred over the last few episodes. A few things still look strange to me. The rest of this post contains potential spoilers for Sengoku Basara Judge End. Firstly, I never translated Isono Kazumasa's profile since he didn't have a formal announcement until now. It's not that interesting but I'd feel bad leaving him out. A warrior in the Oda Remnants Army. He was formerly in the service of Azai Nagamasa, and after that, the Oda clan. Following the clan's downfall, Kazumasa reveres Oichi - Nobunaga's younger sister and Azai Nagamasa's wife - as his master and plans to revive the Oda clan. Kazumasa works behind the scenes in order to rescue Oichi after she's abducted by Tokugawa Ieyasu. Finally, here are those last three episode summaries. I'll have the missing episode titles in a couple of days once this month's magazines are available. Note: Those who have access to the English-subtitled versions have told me that the official English title for this episode is 'Life-and-Death' to retain the pattern of single-word titles. Honnouji suddenly appears in the land of Sekigahara. It's the work of Tenkai, who planned the revival of the 'Demon King of the Sixth Heaven' Oda Nobunaga. Magoichi and Keiji rush to the battlefield in order to put a stop to things, and at the same time Masamune and Yukimura head towards Honnouji as well, for the sake of returning this decisive battle at Sekigahara to its rightful form. While all of these unfathomable occurrences are taking place, Oichi's appearance begins to change, and as expected, the one who appears is...!? At last, Date Masamune stood in front of Ishida Mitsunari. Katakura Kojuurou and Ootani Yoshitsugu face one another. Chousokabe Motochika has been driven into a tight spot before Mouri Motonari. Honda Tadakatsu fought with Shimazu Yoshihiro in the air. Each battle finally comes to an End. What is the Judgement that will be be handed down to the men who risked everything they had in battle!? At the end of all of the fighting, they finally reached a single answer. Tokugawa Ieyasu and Ishida Mitsunari. Their destinies intersect, right here, right now, as their lives collide in the promised land of Sekigahara. Could what the two of them see beyond the battle really be despair, hope, or...?